It may be close to year-end, but it's not too late to finish the year with a bang when it comes to customer engagement. Email remains one of the most effective tools to reach customers with festive, well-crafted and timely messages that encourage action. Here are 11 examples of creative email marketing ideas that you can put to work this holiday season as part of your email marketing campaigns. They'll help you to stay on your customers' radar during the holidays, spread some cheer and maybe even spark some business in the new year. Receiving a holiday gift guide early in the season can make an online shopper's day. The guide should feature current styles or products that are in demand and it should also be generous with attractive graphics. The idea is to give your customers lots of suggestions to accommodate different personalities and preferences. Not a consumer goods business? A holiday gift guide can still work for you if there is a complimentary market you work with or one you want to benefit. Another approach to the gift guide could be a humorous angle or 'gag' gift guide, if that fits with your brand's image or culture. 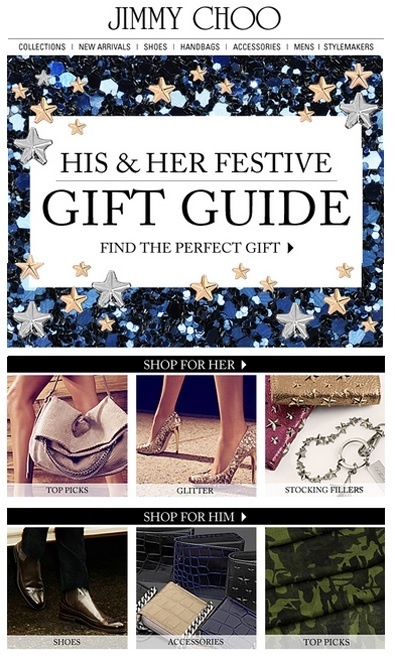 The example below from JimmyChoo.com gives gift ideas geared to couples or anyone interested in a boutiqe-style gift for men or women. When it comes to inbound marketing, we always hear that it's not the best idea to talk about ourselves or tout our accomplishments. Without a doubt, this is usually great advice. However, the holiday season is a time when we can get a little more personal with communications with some customers. Is your company growing? 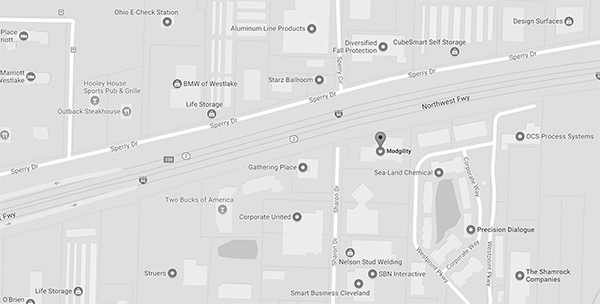 Have you moved to a new location? Did you recently launch a new website? This type of news can be a welcome message in a holiday email to customers because 1) it shares more personal information and 2) this type of news may also be of benefit to your customers. 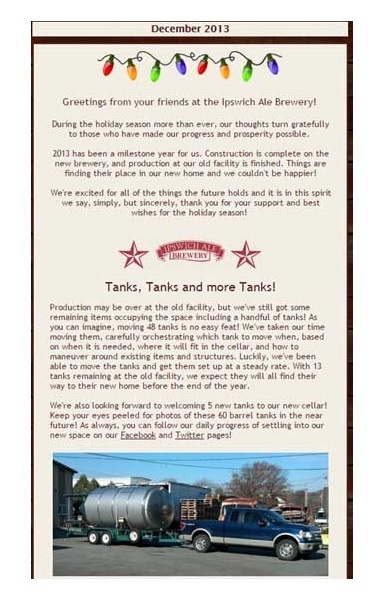 Here's an example of a holiday email greeting from a brewery that shares news of a location move and a little about how the transition is going. There's a uniqueness about this move because it involves moving giant beer tanks to the new location, which I imagine must be a little tricky. They share a photo of the moving process, which is likely of great interest to their customers and patrons. 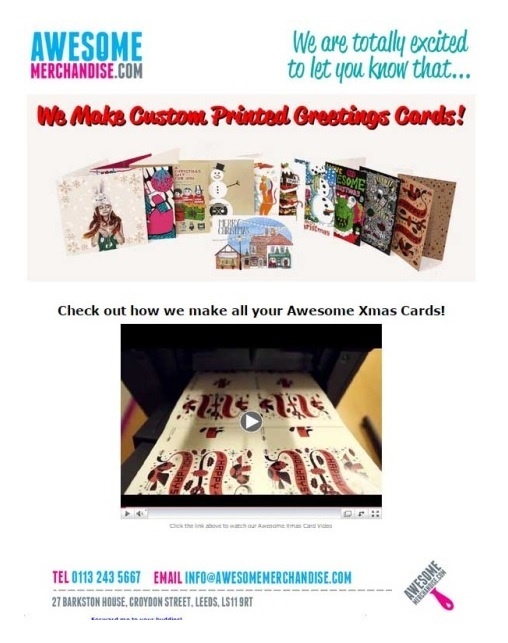 AwesomeMerchandise.com sent a holiday email promoting their Christmas card printing business. It's really more of an ad than a greeting, but it gets attention because of the video included that gives a look inside how their cards are made. Video, animated graphics and/or interactive elements will always increase interest in your message and that's why this works. You can view the video below. Build it Green! NYC is a non-profit outlet for salvaged building materials in New York City. They accept donated materials and sell or re-use them for renovation projects. 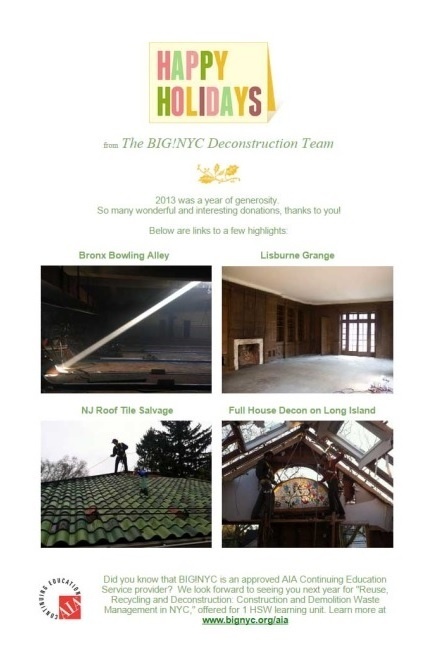 Their 2013 holiday email below shared a few of the highlights from projects that were completed during the year with the use of salvaged materials. Email recipients would have included past donors, patrons, charities and organizations that benefited from the projects. Sharing visuals showing stages of the successful projects can be a big influence on future involvement and donations. The belly loyalty program offers "belly bites" rewards at thousands of locations across the U.S. While the email message below is not specifically a holiday greeting, it shares local deals and steals that a user can take advantage of just for being a belly card holder. 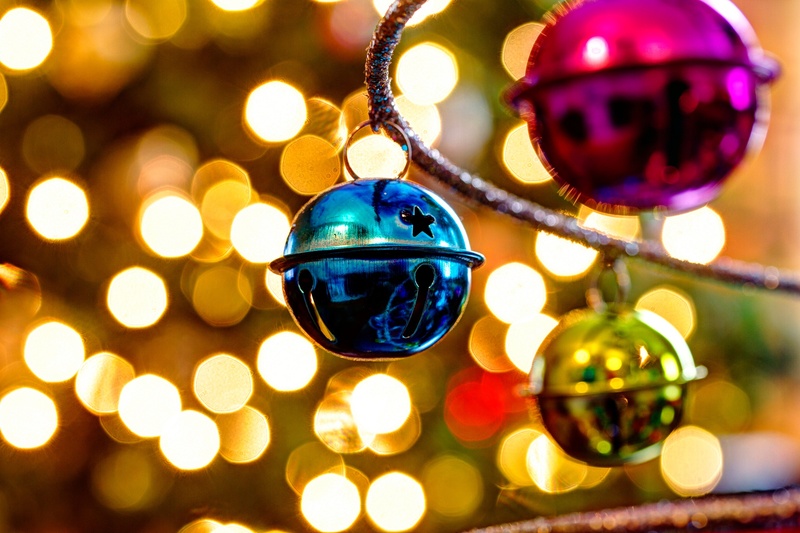 This type of message could be effective during the holidays to engage customers on-the-go. Imagine busy shoppers receiving a message on their phone with the offer to slow down and enjoy a free cup of coffee or a quick de-stressing massage. That's the kind of kindness that could win you a customer for life. "Giving Tuesday" is a relatively new concept that gives charitable organizations an automatic and highly-recognized marketing approach that is becoming almost as well-known as "Black Friday." The fundraising request below includes the recognizable logo and a reminder to donate to a good cause. 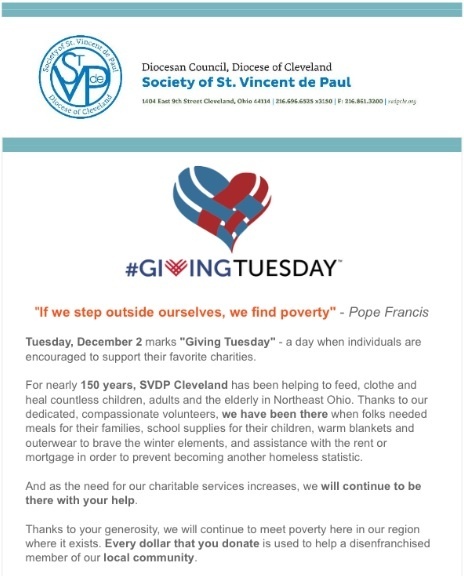 While the message above is actually from the Society of St. Vincent de Paul, a non-profit organization, for-profit companies can take the opportunity at the holidays to conduct fundraising campaigns for their favorite charity. One additional way to earn goodwill with customers would be to match a percentage of each donation, increasing the value to the charity and the value of your company in the eyes of your customer donors. 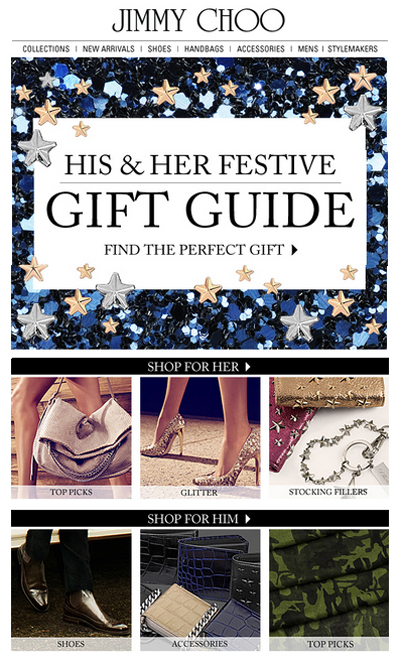 Holiday offers and sales fill email inboxes during the month of December. If you can't find a sale on the brands you regularly purchase, you may want to check your connection — or your spam folder. We get so many offers, in fact, that it becomes easy to file them away or even delete them. Petco found a way to add a little interest and intrigue to their holiday email offer. 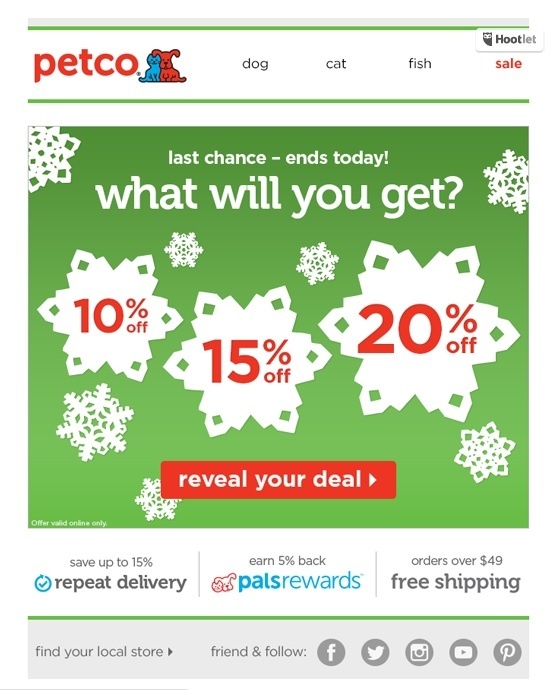 This email from Petco was delivered to current customers with the added 'mystery' of a chance at exclusive, higher savings when you click to 'reveal your deal.' Everyone loves a game of chance, right? Right. Almost as much as we love our pets! Receiving a marketing message over and over again can get pretty annoying. 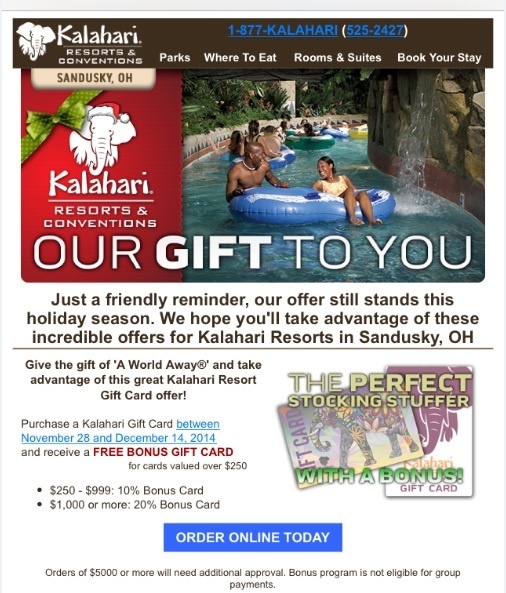 However, Kalahari Resorts & Conventions seems to have the timing of their reminder messages just right. This message below, with the subject line, "A Friendly Reminder," was received exactly two weeks after their first promotional email titled, "Our Gift to You." If you've been to Kalahari in the winter months, you know it's a fun, cold-weather get-away that you'd probably like to experience again. They know you're thinking about it, but you just haven't gotten around to making your reservation with so much going on during the holidays. A "friendly" reminder — as long as it comes along with a valuable deal — can be effective in getting your customers to act on your offer. Ecards are a fun and inexpensive way to send holiday greetings to groups large or small. They almost always work to get the receiver in the holiday spirit whether they're funny, personal or traditional. Digital advertising and design firm Voltage, from Louisville, CO, got Japanese beatboxer Hikakin to perform the song, "Last Christmas," in an unconventional way in its ecard. The performance makes you think at first, "Is that him making those sounds?" and then you just enjoy the show. This brief ecard adds the great element of video and also an overt call to action at the end. But still, the video is well-done and makes you want to listen until the end. 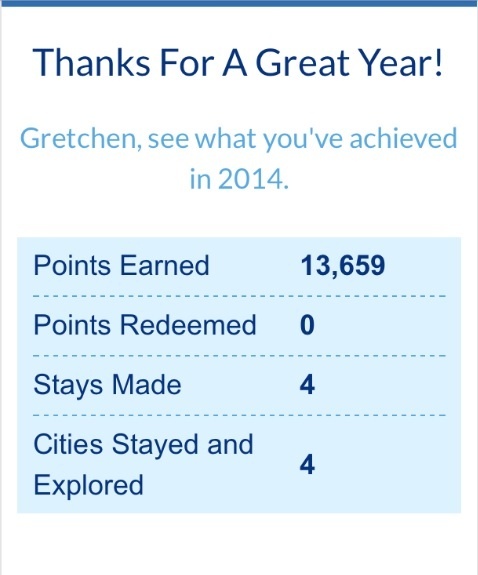 This end-of-year message of "thanks" is from the Marriot Rewards program. It very simply thanks me for my business over the past year, but also gives me a quick look at my progress in their program. This is helpful, interesting information to me, since I am signed up with multiple hotel rewards programs, but don't really follow my participation in any of them regularly. 13,000+ points makes me think I'm on my way to some kind of reward, so that makes me happy! This is an example of a nice "thank you" accompanied by some useful information. It works. Invitations make people feel wanted and important. Inviting customers to a year-end event or gathering without any overt expectation to make a purchase or investment can build relationships and goodwill. The invitation below is for a Mary Kay Cosmetics Open House event. While you can expect there will be the opportunity and maybe even the expectation to buy something there, the event promises discounted gifts, exclusive savings and a donation of a portion of sales to the Mary Kay Foundation. So, even though you may spend money at this event you'll most likely save and donate to a charity in the process. Be creative with your email content, but remain consistent with your brand. Don't venture too far outside your established brand image or content voice, just because it's Christmastime. You want your customers to recognize the message as coming from the "you" they know and trust. Make sure your email messages are responsive. Be sure customers on-the-go during the holidays can view your messages easily on their mobile devices. Understand that if viewers have difficulty viewing or interacting with your messages, you'll lose them quickly. Make the investment in mobile technology. Carefully consider your mailing schedule. 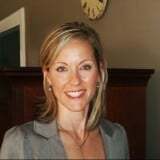 Schedule your email messages to be delivered near the major shopping days if you're planning a sale or discount offer. You might consider sending holiday e-mails on the weekend, as this is the time your customers may have time to read leisure emails. Don't let the year get away from you — engage your customers at the holidays with sincere, but strategic, greetings using one or more of these email marketing ideas. From a simple "thank you" to an elaborate video, it's always a good idea to show your appreciation and spread some holiday cheer. For even more ideas on attracting customers, check out our ebook resource below to strengthen your social media strategy. Happy Holidays!